The relationship between a para-athlete and her guide involves a delicate balance of efficiency while being to handle the pressure of the moment. 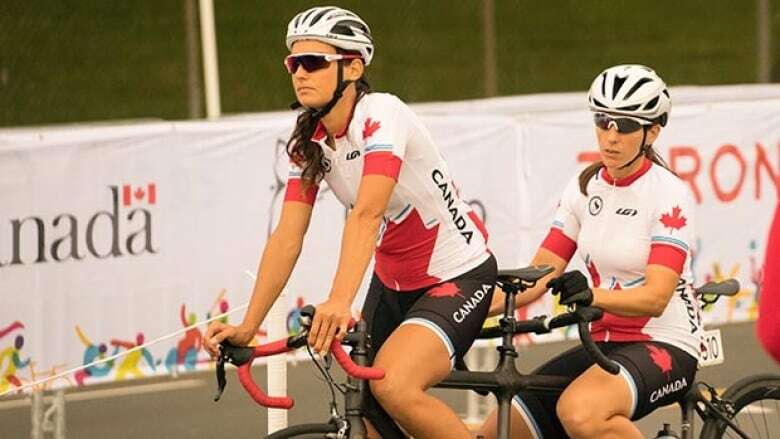 Read how Canadian cyclist Robbi Weldon found her pilot in Audrey Lemieux. In para-sports, it's common to see two athletes competing under one name. Guides are an integral part to events like sprinting, long distance running and cycling. Guides (which are called different names in different disciplines) have the responsibility of being able to compete at an international level, while no longer competing for themselves. Robbi, what do you look for in a pilot? Weldon: You're looking for someone of Olympic calibre but who isn't going for the Olympics themselves. They have to be retired from pro sports for two years and have not collected world cup points for two years. Is it hard to find a good pilot? Weldon: Well people are interested, but it's just that some people aren't able to commit the amount of effort it takes. They don't realize or think it's that serious [of a commitment]. Potential pilots have to go through a bunch of capacity power tests from Cycling Canada to see if they have the ability. There's also the commitment of nutrition and following the yearly training plan. Audrey, how did you become a pilot? Lemieux: I've been a racer for many years. Then, I was asked a couple times if I wanted to pilot once I ended my career in 2010. I didn't know because i was working full time. Then last year, they asked me again and I thought it was good timing. If I wanted to do it, it was then. I decided to go all in and throw myself into the adventure. What are a pilot's responsibilities? Lemieux: I think every pilot does their responsibilities differently, but what I like to do is take care of the bike and make sure the gears are right because it's me who controls the gears. I for sure need to know the course, tell my stoker about the land and make sure we can synchronize. I just need to make sure we are on the same page all the time about the race. We talk a lot about the race the day before, we always have a meeting. When I was on racing my own, the big difference was it was my own plan. I just went and did my thing. But now it's important for me to ask Robbi, "how do you feel about the race? The course? What do you think is going to happen? Are they going to have some attacks?" So always being in communication. and always making sure we're on the same page. How did you meet and become partners? Weldon: A year ago, Audrey was piloting [one of my] teammates and I had a different pilot. So we trained together as teammates for a year. Then, 12 days before the world championships [the coaches] put us together on tandem. Lemieux: The coaches decided to put us together for the specific type of course in Switzerland. [We] were the best combination they found. That's why they put us together. What did they base the decision to make you partners off of? Lemieux: I think it's our strength. In Switzerland there was a lot of climbing. There was a 15-minute climb every lap. We are the best climbers for that type of course. And for [the Parapan Am Games], it's now a progression thing. We stick together to get better as a team. Now that you're partners, has your training changed? Weldon: The goal leading into the next year, once we sit down with coaches and find out the year plan, is that I'll hopefully be moving towards Ottawa to be able to train and be closer to teammates and coaching staff. In Thunder Bay [Ont. ], it's a bit difficult always training in my house on my own, training together only a few weeks out of the year, getting together for a couple of training camps in the winter and then before a World Cup getting together a week before to do training. And what we're seeing against other teams, the top teams in the world like New Zealand and England, is that they've been training two or three years together and they're training every week together. As a partnership are you moving towards training together? Is training apart something that's due to geography, or is it the nature of the cycling programs? Weldon: Generally, I think a lot of sports teams do centralize. Myself, being a mom of two children, I've been fortunate to be able to train in my hometown. But the level in some of the courses and some of the technical stuff we've been looking at are improving all the time and we're seeing that no matter if our power, condition or endurance is there, what's missing is working together as a team on one bike. It would be like having para-figure skaters working separately and then getting together a week before [their] performance. They're very talented, they're in shape, they're ready to go, but to put it together for a performance a week before is tough. Lemieux: We would like to be together more for sure. And next year is the Paralympic Games and we want to be on top of it. So we're going to need to be spending a lot of time together. And also another challenge for us is the winter. So we'll need to train somewhere else. Do you communicate verbally while you're cycling? Or have you done so much training you can just go out there and perform? Lemieux: We really need to verbally communicate. Of course we go see the course, so Robbi knows the course very well, but my role is mostly to tell her technical things, like when I change my gears, or if there's a right or left corner because everything goes so fast. Or if there's a big hill and we have to stand the last 20 minutes to finish strong, I'll say "stand" because we need to stand at the same time, very synchronized and get the most power in every type of effort. What makes a good pilot and stoker? Weldon: A good team is communicating on and off the bike. As Audrey mentioned, looking over the course ahead of time then sitting down and drawing up the course and having a race plan. And then on the course — in training or in competition — I need to have full, 100 per cent trust in my pilot. We're going speeds of 80, 90 kilometres an hour. I need to trust her driving ability, her safety judgement, her race skills. I know Audrey has been a professional cyclist for many years so her driving and her cycling skills are world class. So I have full confidence when I get on the tandem with Audrey that we're going to perform well and we're focused on the competition.…I'm not concerned about my pilot. And to be able to pedal, our pedals are linked with the chain so we're synchronized in pedal stroke. But even in that there are little-minute details in pedaling. If you don't trust in your pilot, you may hesitate in pedaling or pedal not [in a] circular [motion]. So for the two of us, pedaling together is really important. You become more efficient and faster riders. Does personalty come into it at all? Weldon: For sure. It's really important to be a strong competitor. We both have big competitive attitudes and take things really seriously on the bike. We obviously enjoy cycling and have fun doing it, but when it comes to training and competition we want to keep learning, improving, fine tuning the bike, fine tuning our skills, and fine tuning our race strategies. Do you room together? Do you eat together? Do you get sick of each other? Lemieux: We are pretty much together and with our team all the time. We hang out, we eat. Sometimes, like when we were in Europe, we had a day off between races so we went and had coffee in the nice little town and enjoyed [it]. We are friends, we are competitors. It is definitely important to have a good relationship. If you win an event, does the pilot win a medal as well? Lemieux: Yes, if we win, we both get a medal. Is there anything else you'd want people to know about your partnership? Lemieux: I think what is nice is we are a team. We want the same result, the best result. And if somebody doesn't feel so well one day, we can help each other to feel better and keep motivated.